Carmichael coal mine is a proposed coal mine in the Northwestern coast of Australia (Galilee Basin), which is a venture of the Adani Group from India. It is a mine of epic (and disastrous) proportions. The coal mine, if functional, is expected to produce 60 million tonnes of coals per year, or 2.3 billion tonnes in 60 years. It would be the largest coal mine of Australia. In October 2015, the federal government gave its approval for the project to start, and on February 1st 2016, the Queensland State Authorities gave an environmental clearance for the project to kick off. First off, if the project does start mining and production, 60 million tonnes of coal that will be produced per year could make the carbon emission of the world shoot up through the roof. Estimates suggest that burning of coal would add 130 million tonnes of carbon dioxide into the atmosphere every year. Over its 60 year period, total emissions would amount to 4.7 billion tonnes of carbon dioxide. While this is alarming enough to rethink the proposal, other problems exist as well. For instance, a rail road project is set to begin to connect the mines with the Queensland coast, so as to export the coal produced. A rail road in that area would have to cut through the habitats of black-throated finch, ornamental snake and yakka skink apart from other animals living in the area. It puts these animals in extreme danger of extincting over the 60 year period of this project. Once the coal reaches the coast, it is to be transported via ships to various parts of the globe. The problem? This coast is directly adjacent to the Great Barrier Reef, the largest reef ecosystem of the world. Coral reefs are extremely sensitive to the slightest environmental changes; they can grow only when the conditions are just right. This ecosystem further supports so many unique and endemic organisms like saltwater crocodiles, green sea turtles and leatherback sea turtles. Other species like humpback whales and many reptiles are found in this region. This reef is already being threatened by climate change and environmental pollution from activities in Australia. Sending more ships through this ecosystem, along with the carbon emissions associated with this project, would mean taking it to the guillotine. According to the Environmental Impact Statement submitted by Adani Group, the Carmichael River cuts across the mine in East-West direction. Both open and closed mining, therefore, would cause huge pollution in the river water. On both sides of the river, there is an active riparian zone that is bound to be destroyed if the mining begins and continues. The measures taken to prevent flood losses in the project area is going to cause changes in the flow of the water. Flow regulation is another activity that is known to cause huge environmental degradation (more on this in future posts). Groundwater levels are expect to fall by 20-30 meters in the vicinity in the project area, and around 10-20 meters in surrounding areas. Potential leaks of hazardous chemicals could damage both surface and ground water (while the EIA report suggests that damage to groundwater is unlikely due to the geology of the area, the leaks could affect the ground water in offsite areas). Does the government recognize all this? Yes, they do. The EIA Statement is rigorous, and highlights many of the dangers that this project will cause. But the Adani Group have won over the government with the likely economic gains from this project (typical). Massive employment generation is the linchpin. Adani Group believes that it can generate close to 10,000 jobs over the course of this project. Nevertheless, the project has been granted an environmental clearance only if it sticks to “36 strict environmental conditions”. Let’s take a look at some of these conditions. • 5,600 hectares of yakka skink habitat. $1 million will be provided over 10 years to protect threatened species in the Galilee Basin. Measures to “return” at least 730 mega-litres of water per year for five years to the Great Artesian Basin to replace water used during mining. The Doongmabulla Springs are part of the community of native species dependent on natural discharge of groundwater from the Great Artesian Basin. The measures say that the drawdown from the groundwater that feeds the springs must be limited to 20 cm to protect the species of this area. 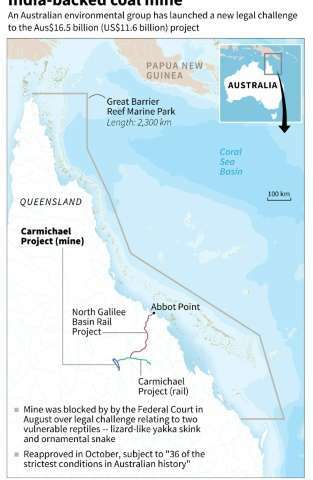 The report says that since the mine is 300 km inland, it will have no “direct” impact on the Great Barrier Reef. To control the indirect impacts, strict bans on offshore disposal of wastes and strict shipping measures will be implemented. To prevent used water from the mines to affect the Reef, sediment dams and storage areas are to be constructed (because that’s what we need. More construction). First, If the Australian government is committed to saving the Great Barrier Reef, as outlined by the report, it would never have even considered the project in the first place. The environmental degradation this project will cause cannot be trumped by the economic benefits. Second, the measures to counter the environmental degradation are not enough because of the time frame of the project. The project is expected to run for 60 years. So much can happen in 60 years with the government, its policies, with the environment and its dynamics. Also, these measures proposed are only for the next 5 years (see up). What about after that? Third, in a world where most countries are looking to phase out coal technologies and switch to renewable resources, coming up with a mega-coal project is unnecessary. And plain idiotic. Well, the Adani Group has been cleared by the federal and state governments for the project, but other groups have raised their voices against it. Among them are the native landholders of the area, Mackay Conservation Group, Land Services of Coast and Country Inc. and Greenpeace Australia. Greenpeace Australia are quoted to have said that “the government has sold out the Queensland environment”. This is good news. Court cases are being fought as you read this. International and environmentists’ pressure may be the only things that will stop this project from seeing daylight.